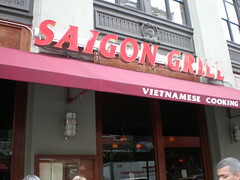 When I was working on the Upper East Side, Saigon Grill was my favorite place to eat. The food was great, though the restaurant itself had an almost cafeteria-like atmosphere. With its chipped formica tables, flourescent lighting, plastic potted plants, and service that was a notch above indifferent, Saigon Grill seemed to be communicating a message to diners: nothing pretentious here, just great Vietnamese food. During off hours the staff would sit in the dining room, trimming vegetables for later service or eating their own meals. There was always a table available for one, no matter how busy it was. Unlike many Vietnamese retsuarants I have been to, there was a large vegetarian section on the menu, and many of the rice and noodle dishes could be made vegetarian. I was especially fond of the vegetarian Bun, room temperature rice noodles covered with cooked vegetables, but the curries were very good as well. The Rau Cai curry came served on noodles, with rice on the side, and a flat pancake for wrapping. Somehow all of these disparate elements came together beautifully with the heavy, spicy curry. Both the summer rolls and the spring rolls were underwhelming, but the Rau-Cai Nuong was a real star. It was simply large chunks of vegetables grilled on skewers, served with a peanut dipping sauce. The vegetables were always grilled to perfection, especially the broccoli, an unlikely candidate for girrling. The broccoli florets came out crispy while the stalk came out crunchy, a true marvel. I’m still unsure of how they accomplished this. I was disappointed when they closed it down for “renovations,” though I heard rumors of a new branch opening up south of Union Square. Time went by and the UES restaurant never reopened, and then I started working in Brooklyn and Saigon Grill fell off of my radar. Recently I was in the Union Square area around lunch time, and decided to check it out. My first thought upon entering the new Saigon Grill was that I had accicdentally gone into the wrong restaurant. The new location has high ceilings with fancy light fixtures, dark wood paneling with recessed bottles of wine in impeccable lines. It’s also about five times the size of the UES location, and at lunch was incredibly busy. I saw men in ties, families crowded around tables, couples trying to enjoy an intimate moment. None of these people would have felt at home in the old location, though they obviously felt at home here. I felt out of place, though I was immediately shown to a table for one. I was comforted by the sight of the trio of chili sauces on each table, just as I was used to. The menu, despite its fancified padding, looked the same. I ordered my favorite vegetarian Bun, though I was disappointed to see that the lunch special price was now $7.25, up from $5.25 on the UES (the Bun is $8.25 outside of lunch). My food came just as quickly as it used to, thanks in part to what seemed to be an army of wait staff stalking the dining room. It certainly looked the same, a huge portion served in a plain white bowl. One bite was all it took to put my mind at ease. The reason that I love the Bun so much is the contrasts in taste, texture, and temperature. The salty cooked vegetables with the sweet carrot salad, the soft rice noodles with the crunchy veg, and the cold noodles with the warm topping; each bite gives you different proportions of those sensations. It makes you want to keep eating it, until suddenly you’re staring at the bottom of an empty bowl. So I am torn about this transformation for Saigon Grill. The food is just as good as it always was, but a restaurant is more than just its food. I am glad that they seem to be successful, but in their change they seem to have left behind what I liked about eating there. Perhaps its my fault; I always felt like Saigon Grill was the kind of neighborhood joint that you could surprise a friend with. Its newer incarnation make it feel to me like any other, run-of-the-mill upscale Asian restaurant. If that’s what I wanted in a Vietnamese restaurant I have lots of choices, and Saigon Grill wouldn’t be at the top of that list.